I’ve written a lot about solitary confinement and the terrible damage it does to anyone–but especially young people who are still physically, intellectually, psychologically unformed, vulnerable–children. I’ve seen kids in solitary lock-up; in a very small way I’ve experienced the sensory deprivation that they experience 24 hours a day, and witnessed what that deprivation does to them. There have been calls, pleas from all kinds of organizations both nationally and internationally, for the US to end the practice of putting kids in isolation. To no avail. Why? I can’t help asking. Why? Solitary Watch is our watchdog site that won’t let us forget what goes on in these rooms of isolation. They recently had a graphic that brought back to me the times I’ve been able to visit young people in solitary. I share that graphic. 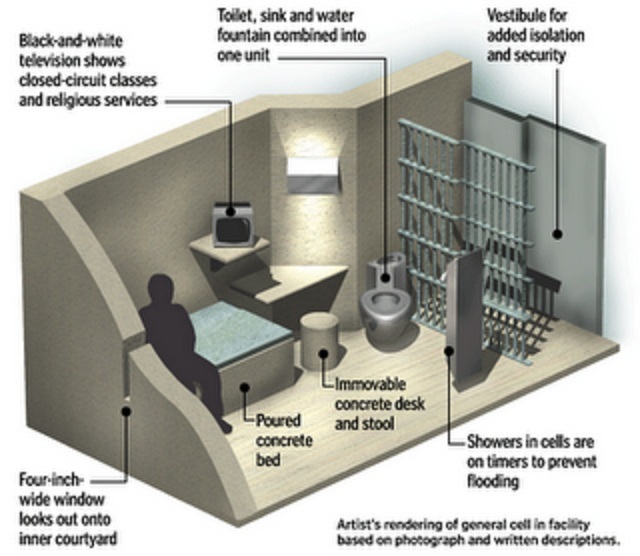 This is what we are talking about when we talk about “solitary confinement.” Imagine yourself in that room, 24 hours a day, month after month. Now, imagine you are 16 years old. Thanks for the re-blog and getting the word out. As a teacher of vulnerable children, I cannot imagine how anyone can believe that this is the right way to deal with anyone, much less children who need our understanding and guidance. This issue needs the glare of publicity until it is no longer acceptable, anywhere. Somehow as soon as a young person gets arrested and serves time they cease to have society’s compassion, or be seen as children. At last! Someone with real expstriee gives us the answer. Thanks! Thanks for the re-blog and for your interest and support of kids at risk. Kids are the responsibility of us all. Have a good week. Yes exactly! Then the food… Baloney sandwiches… That helps build healthy bodies. It’s treatment than very few of us can imagine. It is terrible. Solitary housing units are both cruel and unusual in their implementation. To place adults much less kids in these confines for extended times is unconscienceable. When I was a teacher of students with emotional and behavioral disorders we had “time out” rooms. I tried to leave the door open and use it only when absolutely necessary for short periods until the student was deescalated. I regret now using those rooms at all and hope they are banned in schools. Knowledge is power if used wisely. Next wel’ll find out kids are being force fed when they refuse to eat the mess they’re given. Best to you, David. I’m always amazed at the great care parents and educators take in isolating children, worrying that it bot be “too long”, “too harsh.” Yet as soon as a young person gets locked up all that careful handling is forgotten. Young offenders are that–young offenders, not children, but a separate breed of being, so it’s easier to make those isolating decisions. You are right, Jeff, every teacher, every responsible adult must look hard and long at the power of isolation on a child before using it. Reblogged this on Mind Chatter. I agree. Young people define themselves by their social interactions. It has been shocking to me seeing how quickly young people de-compensate in this kind of isolation and deprivation. Solitary confine is a bad idea for anyone and as you explain youth are especially effected because of their immature coping skills. Cells are really small and it is really hard to imagine anyone living in such a small space. You are so right. These young people have never learned the coping skills that would keep them out of trouble; so they certainly don’t have the skills to survive in solitary confinement. As you mention, just the smallness of the space itself is harmful to a young person’s development. Thanks for your comment. I have seen many adults breakdown in solitary confinement. I can imagine how this would affect a teen. I am glad i did not work youth corrections. I am in Canada and the solitary confinement rooms in the youth detention and “treatment” centre here is just an empty room but it does have a window. You are expected to do your business on the floor and when they decide to let you out you are given a mop to clean it. In Harford Co., MD, there are no televisions or showers, and all kids charged as adults are held in an adult jail, in isolation or segregation, pending trial – sometimes for years. In isolation, they are often denied phone calls, visits, mail, reading material, etc. and wear only hospital gowns. They are not even allowed bedding. We are looking for an attorney interested in filing a class action lawsuit, on behalf of these kids. Please contact me (Eileen Siple) on facebook, if you know of an attorney interested in filing suit. What you describe is unconscionable and inhumane. Those conditions demonstrate how, as soon as a person is arrested and incarcerated (guilty or not),they become and are treated as subhuman. If people hear about the cruel treatment of animals they go crazy and are outraged! These are people you are talking about. I commend your legal efforts and suggest getting in touch with the American Civil Liberty Union. Thank you. I am trying to get in touch with the ACLU. I would also like to find an attorney in MD who is willing to take this on. I know of at least 6 boys who are interested in a lawsuit. Some of them turned 18 while in the jail, and were moved into the general population. Others have been held in isolation or segregation for anywhere between 7 months and 2 years. All of the boys have been denied education, and they have to pay for whatever minimal medical care is provided. I could go on and on, but suffice it to say that the situation is absolutely “unconscionable and inhumane”, as you said. They are just kids. I was 16 years old the first time I was solitary confinement. I spent two months in a concrete room with a 2 inch mattress and a concrete bed frame with a toilet about a foot away. There showers were cold and my one hour a day to rec was a cage. Sometimes I had a neighbor most of the time none. It was there that I first truly felt that I didn’t exist or even matter. I was 16 years old and I hated myself I hated world my life didn’t matter. I still sometimes feel this way even though I know it’s not true. I still carry that weight on me. I’m 36 years old now and I still haven’t let it go. Thank you for this stark picture of what we do to young people when we isolate them in such inhumane places. You state so well what all the research says about the effects of solitary confinement on anyone, really, but most certainly on a young person. I am so sorry that this happened to you. But yet, what comes through to me is how strong you were and are to have survived that hell. As you know, so many don’t. You had and have resources that you could pull on to make it out. I’m happy that you have shared your experiences on “Kids in the System” so that other readers can understand what such isolation does to a person. And by sharing this you are helping others–a step to letting it go. There is nothing to be ashamed of; an injustice was done to you. So hold your head high and remember that you made it through. Thanks again. I wanted to re-post this piece about the physical limitations of a solitary confinement cell in light of Albert Woodfox’s memoir, “Solitary”, about his 40 years locked up in solitary in Angola. Just the physical limitations alone can break the human spirit. Woodfox’s courage and strength are remarkable.